Hello, has anyone built the Carolina Angler? I've bought the study plans. I would like to see any pictures of it!? You might be the first one, should you choose to build one. I don't see any pictures or anyone in the project registry on Glen-L site. I think I will... Gotta wonder why no one else has!? the vast majority of folks on this forum build smaller, trailerable boats. Carolina Angler is too large for most people, hence not much action on this forum. Yeah many of us are landlocked so trailerable is a necessity. Plus that's a big boat with a pretty specific use case. I am on the Mississippi River which I can eventually get to anywhere... especially Key West! I like the idea of the little cabin in it. One could sleep overnight without the need for a room. If anyone wants to offer their thoughts on the reduction gear size I will need for a 300 HP 7.4 L velvet drive- please chime in!? rblenens...I am outside a small town in Mississippi. .
Hurley. ...camping out in my nieces back yard...love this area. ..fishing has been fun in shore near the ship building docks...I can't get as close as I would like...a couple of navy ships in port for repairs so we have to stay a few hundred yards out...wish this wind would die down. ..would like to go ..check out the islands ofshore.. So, do you feel the Carolina Angler is a capable "offshore boat?" I truly believe that is exactly what it was designed to do..
Heck I took the Flats Flyer out of Sebastian Inlet in 8ft swells......just wanted to know what she could handle. ..
You can look at Flats Flyer Build in SC...on page 5...there a few pictures. ..to give you a idea. ..
rblevens wrote: I am on the Mississippi River which I can eventually get to anywhere... especially Key West! Are you on the Mississippi up in Illinois? If so, it may be cheaper on fuel to go diesel, to get to Key West. 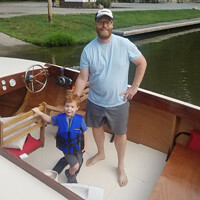 I have a donor boat, a limited budget, and I am retired (no income)- my wife has about 5 years left before she retires. I thought I could put together this boat (with 454) and mess around with it here in the river. If I ever made it to salt water I would contemplate a re-power at that point. I am in Illinois, near the Illinois and Mississippi river confluence, Alton, IL... btw. Does 28.5 gallons an hour for one 7.4 engine sound about right in normal seas?